I first heard of Christmas Pickles in German class when I was in High School. During our first Christmas season together, Aaron and I found a Christmas Pickle in a blown glass ornament store. So, of course, we bought it!! 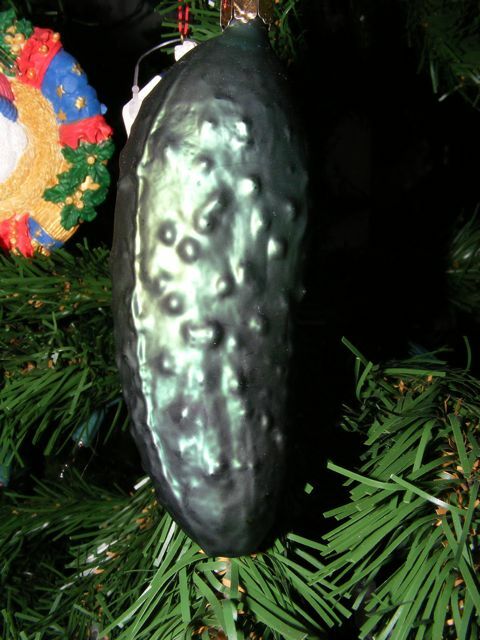 On Christmas Eve we hide the Christmas pickle on the tree. When we begin our festivities, the kids search the tree for the pickle. Whoever finds the pickle gets a special gift. You could use anything for the special gift - just something that any of the kids would like. To: The World From: God. Inside is the baby Jesus from our nativity. The child that finds the pickle gets to open this gift and place baby Jesus in the manger. Even though they aren't getting anything 'extra', the kids all love to be the one to find the pickle and put Jesus in the manger on Christmas morning. 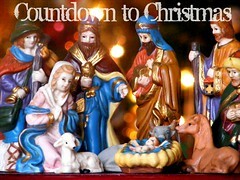 It is a fun tradition for the whole family. I think I'm gonna make one, out of fabric, and hide it and start this in our home. Sounds like fun!